Land art, performance, installation artist. His art research usually focuses on surrounding space, which becomes a principal medium for his artworks. Was born 1989 in Sumy (Ukraine). Education: Dmytro Bortnianskyi Higher School of Arts and Culture of Sumy; National Academy of Fine Arts and Architecture; Kyiv Academy of Media Art (Ukraine). Participant of land art symposiums in Ukraine: Mohrytsia, Mythogenesis, Khortytsia. 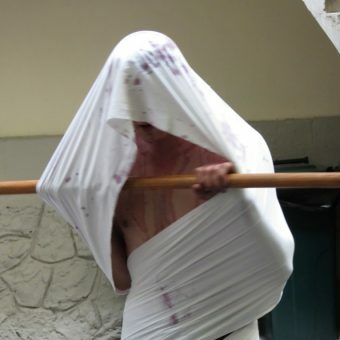 Performances at the festivals: Days of Performance Art in Lviv; Interakcje (Poland); After School Special (Bergen. Norway). Selected solo projects: Direct Connection (Efremova 26 Gallery, Lviv, 2013); The Dark Space (Closer, Kyiv, 2016); In the Shade (AcademArt, Sumy, 2017).